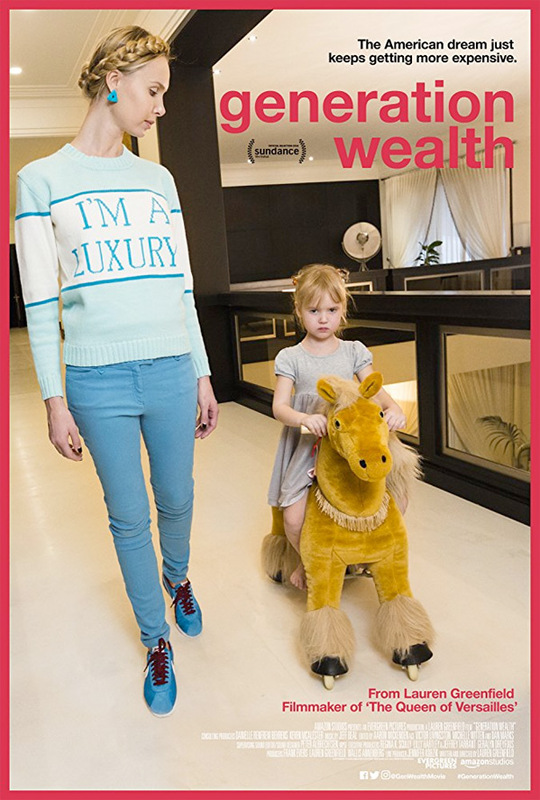 Laura Greenfield, a photographer who gets the lens turned on herself several times during “Generation Wealth,” indicts consumerism not only in the U.S. but also in countries that have been infected by the disease recently, principally China. She deals with a wholly different degree of unhappiness than Ken Loach, whose working-class documentaries show empathy with the poorest people in the UK and Europe, particularly migrant workers. By contrast Greenfield believes that the excesses in the U.S. are driving the country off the cliff, much as (allegedly) Ancient Egypt went over the edge at a time that it was at its greatest prosperity. One would expect her to draw a parallel as well with the fall of Rome, though it was not the excesses that led to its decline but rather its overextension in the known world that could not be defended by its armies. Still, she believes that you can understand the mainstream people in the U.S. by dealing with the excesses of a minority but this simply does not make sense. Some Americans work 100 hours a week in law offices and financial firms to build greater fortunes, ignoring their families and depriving both their spouses and children of loving attention and discovering that the gobs of money did not make them happier. A far greater problem is the need for so many of our people to work two or three jobs simply to make ends meet and thereby spending insufficient time with their families. It’s better to be rich and ignore your families than be poor and doing the same. At any rate, she does not focus strictly on the desire for a great deal of money especially by today’s young people as shown by polls that find college students overwhelmingly saying that money was their most important goal. She zeroes in on women who do not want simply to keep up with or even surpass the Joneses but with women who want to look like the entertainers they see on TV and in the movies. They go in for plastic surgery and after getting the initial treatment they want more of the same. One woman, Suzanne, is a hedge fund executive who wakes up at age forty to discover that what she really wanted was children. Strippers, who actually go to dance school to learn how to massage the poles become celebrities and have money thrown at them by delighted men. The most interesting character is Florian Homm (see his Wikipedia article), a German businessman who was indicted in the U.S. for investment fraud, fled to Italy which set him up for extradition to the U.S., but wound up back in Germany where his country would not extradite him. He did not look unhappy as he puffed on a fat cigar. So let us not feel too sorry for the small minority of folks who are celebrities, or who want to be celebs, and who have the money and the inclination to reshape their figures. The people here are the extreme. Why Greenfield understands the majority of people by studying the extreme is beyond me. What’s more the entire film is unfocused, shifting from a hunger for wealth to a desire for celebrity status, never showing how conspicuous consumption by a relatively small number of people is a real problem for America or even for China and European nations who are generating a love for money beyond what a normal person should want.